If you are a registered Google AdWords user then you probably received an email from them with a thank you note and link to a very impressive video on YouTube. At first it seemed kind of silly and I wasn’t sure where it was going but after the second stint where I could more clearly see what was going on, it was apparent that this was no ordinary video. The video starts off with a cordial greeting from Google AdWords Senior VP Susan Wojcicki. Shortly afterward a scientist (actor) appears with a large remote device and you are transitioned to the first gimmick, the Spelling Bees which attempt to write your company domain name in the sky. I wasn’t paying close enough attention to notice the domain name written backwards. In the second stint they pursue a “big low-tech” idea using 10M dominoes to say thank you, but that effort is destroyed by a helicopter mistakenly flying too low and ruining the card. It was here that I first noticed my domain being used. 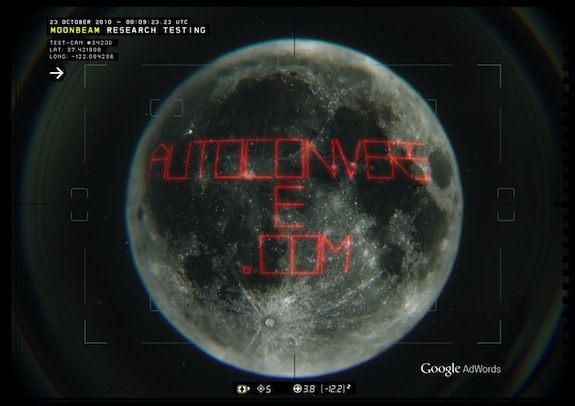 In the third stint, Google writes your domain on the moon. Really they do. You can see it in the video. Since I am not able to embed the video here in this post, you should be able to use my link to view it on YouTube. If you received one too then I suspect the only difference would be the domain that appears in the video, which, if you think about it, is what is so extraordinary about it. I didn’t realize you could do such custom things on the fly using video these days.